Lighting Trends You’ll LOVE Just in Time for Valentine’s Day! It’s time to head over to The Buckeye Chocolate Company to grab some treats and book your dinner at Square Bistro,because love is in the air across Northeast Ohio! Electricians near you aren’t immune to catching the love bug! After all, who do you think installs all those dimmer switches for mood lighting? We thought it might be a fun time to look at some of 2019’s hottest lighting trends, ones that you’re sure to love, to get you in the mood for a little romance this Valentine’s Day. Perhaps no other romance in history has sparked intrigue like Marc Antony and Cleopatra. Chunky, marble-based lamps are capturing the feel of ancient Rome while providing the perfect light accents for your home. Real marble lamps can be expensive, but faux alternative options look great and can save you enough money to take your queen out for a nice dinner. Let your brass fixtures go “au naturel” this year. Natural, unlacquered brass fixtures are taking center stage. And, you can go big, because large fixtures are very much the rage this year – so go wild! What’s sexier than intelligence, right? Any bulb named after Thomas Edison must be a smart choice! These retro-styled bulbs can provide a soft light and look great with industrial décor themes. A trip to the art museum makes for a romantic afternoon, so why not harness some of that creativity and bring it home with you? Structured lighting looks like a modern work of art and provides beautiful light throughout your room. You can’t give her the moon or the sun, but you can give her a replica! Giant spheres, whether they be paper lamps, brass elements or glass, are popular this year. It’s great lighting for a little moonlight waltz when it’s too cold to go outside! Now that we’ve set the mood, it’s time to make sure you are ready to incorporate all these great lighting options in your home! 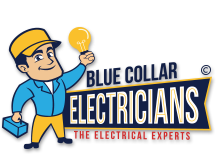 Contact Blue Collar Electricians today, and we’ll make sure that your Northeast Ohio home is ready to see the light. We can test your outlets and even help you install your chandelier or fan to keep you safe and sound for Valentine’s Day and beyond!